Thirty of our favorite heart-centric postcards, the most important of Valentine's Day symbols. From the beginning of Valentine's Day as a popular holiday in the 19th century to the present day, the heart as a graphic symbol representing the human heart has been the most iconic and important of all the symbols of Valentine's Day, and indeed of romantic love in general. 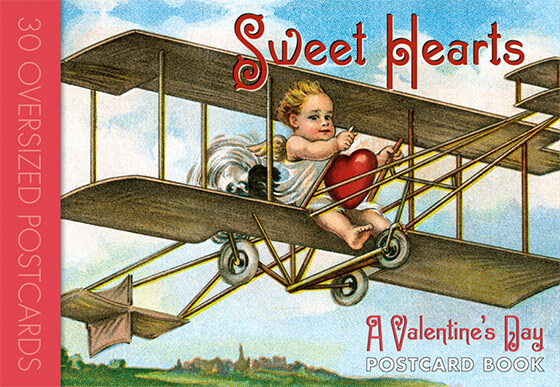 During the picture postcard's golden era, approximately the first two decades of the 20th century, millions of Valentine's Day postcards were produced, sent and cherished. A great number of these featured hearts in all manner of guises. For our Sweet Hearts: A Valentine's Day Postcard Book we have selected thirty of our favorite heart-centric postcards. We offer hearts with thermometers, heart houses, heart airplanes, heart boats and heart musical instruments. This postcard book also features heart garlands, smiling hearts, boxes of hearts and hearts drying on the clothesline.